Sweet, spicy, citrussy – I absolutely adore hot cross buns. Toasted, and spread with coconut oil, then topped with mum’s homemade marmalade, they’re a favourite Sunday treat. Earlier this week, I was alerted to some mass-produced hot cross bun popcorn on the market, full of whey byproducts and scary looking ingredients and I instantly knew I had to have a play around to create my own. So, I took one for the team and did some very tough experimentation and ate a lot of incredible popcorn to bring for you (just) in time for Easter. This recipe is completely indebted to Thug Kitchen’s Rosemary Caramel Corn recipe, which is so beloved in my house that the book tellingly falls open to its page. During a movie night with friends, we once made three batches back-to-back, popping more kernels the moment we reached the bottom of a bowl. The rest of the book is fantastic too – if you’re looking for your next cookbook purchase (and aren’t easily offended by swearing), we’d highly recommend it. We can’t pretend this is a health food recipe, but it’s a lovely treat for a special occasion. I’m down in Dorset for the weekend doing some last-minute wedding prep, and it is a *stunning* day – I hope that it’s equally gorgeous where you are and that you have nice plans. Happy Easter! Heat a large pan over a medium heat with 1 tbsp coconut oil. Add ⅔ kernels and wait for them to pop. Put back on the heat and listen to the rat-a-tat popping, shaking the pan occasionally. Once the popping slows down to once every couple of seconds (or if you start to smell burning! ), turn off the heat and put it in a very large bowl to mix in your caramel later. Zest your lemon and orange and chop the strips into half-centimetre pieces. In a small saucepan, melt the coconut oil, then add the brown sugar, syrup, zest, mixed spice and salt. Heat for 2-3 minutes, until it starts to turn darker in colour and smell caramelly. I always thought that you couldn't stir caramel, but you can with this one, and you should, to stop it catching. Take off the heat and stir in the baking powder. It will puff up to double the size, and go paler, in a very pleasing scientific-experiment kind of way. 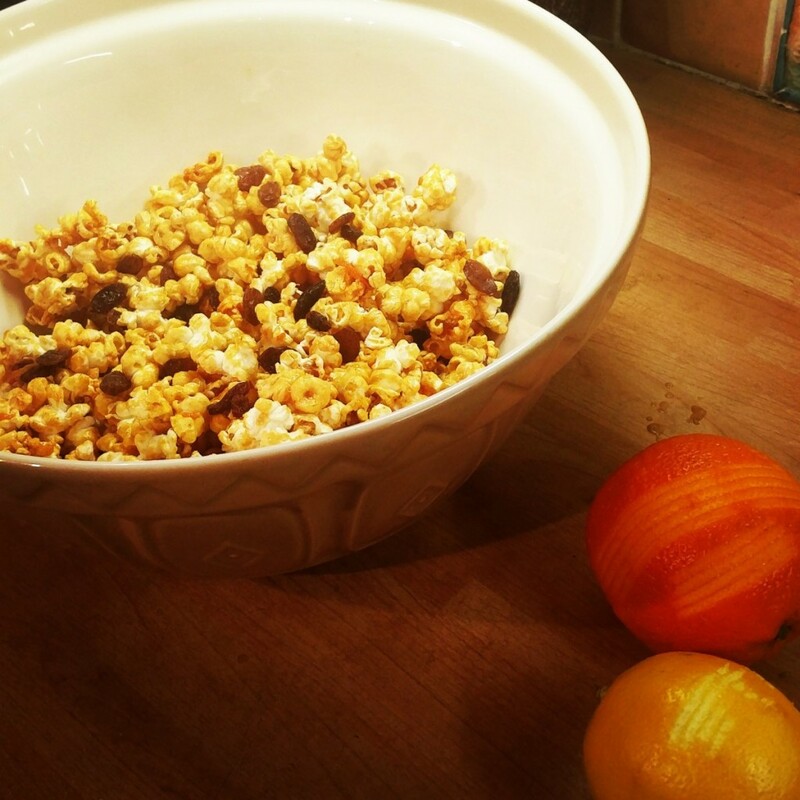 Pour your caramel over your popcorn and stir well to coat. Line two baking trays with parchment pour your popcorn in a single layer over both. Turn off the heat in the oven, and put both of your trays in for fifteen minutes to crisp up. This will seem like an eternity, but it really is worth it for the difference in texture. Remove from oven, add raisins and devour.